They enlist the somewhat unwilling help of Saga, a human girl who can see Season Fairies. Much to her annoyance, Saga's perfectly planned and ordered life has just become a little too lively for her taste. Together, they search for the mysterious Twinkles while trying to perfect their magic. Have you ever wondered why the snow falls, the wind blows, and the clouds fill the sky? 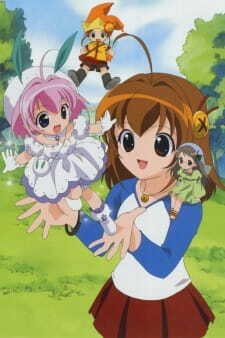 A Little Snow Fairy Sugar shows us that everything is controlled by musical little fairies! Weather has never been so adorable! A Little Snow Fairy Sugar revolves around an eleven year old girl Saga and the little fairy apprentice Sugar that only she can see. Sugar has been sent to earth to complete her training and become a full fledged snow fairy. But to do this she must find something called a "Twinkle" which will make her magic flower bloom and signify she is a fully fledged fairy. Saga is a serious girl who plans out everything meticulously and lives a very ordered life. When Sugar comes into her life she turns it all completely upside-down. The story mostly has a slice of life feel to its pacing. The episodes deal with everyday issues and are mostly lighthearted and funny. At times though some of the messages portrayed can be pretty powerful and deep. Sugar and her other fairy friends who show up are all mostly extremely naive as to the way the human world works, which makes for the source of most of the shows humor. Even though everything in the storyline plays out predictably, it was still an enjoyable experience. Any series in which the plot is mainly slice of life requires great characters to be successful and that’s certainly the case with this anime. The cast gets quite large; however the series does a nice job in sticking with the characters that are the most important. At the top of this is of course Saga and Sugar. When the story begins they are basically complete opposites. Saga is serious and mature while Sugar is reckless and naive. It’s impossible not to fall instantly in love with either of them. Their relationship is rocky at times do to their personality differences but they both learn from each other and become more complete because of it. The supporting cast is one of the best I have seen in a series before. Particularly notable is Sugar's fellow fairy apprentices Salt and Pepper. Pepper in particular was so adorable that I wanted to reach into my television and pull her out and cuddle with her. Viewers will probably also enjoy the antics of Saga's classmate Greta, who is herself proclaimed rival. Artistically the series is quite good. The character designs for Sugar and her friends are really adorable. The settings feel very early 19th century Bavaria. The fashions the characters wear don't really support that and it just seems like a place lost in time. The music is very important to the story and is performed beautifully. Since all the fairy's weather magic is performed using an instrument, there is a wide variety of sounds. The classical music score meshes perfectly with the stories laid back approach. Additionally the series' OP and ED themes match the shows cuteness to a tee. I also enjoyed the seiyuu performances and it was nice to hear the voices of some actors you don’t normally hear in the roles of main characters. Unfortunately I also heard some of the English dub too, which is typically bad and I recommend you stay clear of it. I really enjoyed my experience with A Little Snow Fairy Sugar. It's a bit of a unique take on the fairy genre and I recommend it to everyone who enjoys slice of life. Be careful to brush your teeth afterwards though as the cuteness and sugary sweetness will likely rot your teeth out. I love this anime so much I have the whole series. Tiny Snow Fairy Sugar is just too cute for words. And yet, despite it's adorable factor, I can honestly say this anime made me cry at the end. Basically, to sum it up, the story is of a young, punctual, planning girl named Saga who, much to her dismay, happens to encounter upon a small fairy known as a &quot;season fairy&quot; (and it's not so long afterward until she meets others). The first little season fairy is named Sugar, and apprentice to become a great snow fairy. Now, you can't say Saga is the most happy to find Sugar. Actually, she's anything but. She doesn't want anything to do with these crazy &lt;i&gt;things&lt;/i&gt; she's stumbled on-- they're absolutely ruining her plans! But soon enough, Sugar beings to live with Saga after the magic seed was planted in Saga's mini toy piano in her room. Now Saga has to deal with Sugar as she tries to find the mysterious &quot;twinkles&quot; to become a full-fledged season fairy! What's a girl to do? Okay, so maybe the story isn't amazing, but it's wonderfully adorable, and I love the interactions between all the characters. Some parts of the stories have a few flaws, but never enough to distract the viewer. One thing I adore about Tiny Snow Fairy Sugar is it's beautiful backgrounds. That's the thing, it doesn't take place in Japan; it takes place in Germany, which I find refreshingly different and appealing to watch. The backgrounds are gorgeous watercolors. Also, the character designs are by Koge-Donbo (author of Pita-Ten and Kamichama Karin) which makes the expressions extra adorable, especially with Sugar and the other faires. The opening song is very catchy and chipper, contrasting with the more sweet and melancholy sounding ending theme. The music in the background is low-key, consisting of mostly piano and string instruments. Saga and Sugar's personalities clash which makes their interaction all the more interesting. Saga is orderly and mature and Sugar is spontaneous and energetic. I'd have like to see Ann and Norma more developed, as well as other characters, but Greta makes up for that, as she is a nicely developed minor character. Greta constantly wants to be Saga's rival, although as you see as the series progresses, she actually just wants to be friends with Saga (though she'd never admit it). Not all would enjoy Tiny Snow Fairy Sugar. Many might be put off by the title alone. However, despite the sugar-coated exterior it is actually a sweeter, more-heatfelt anime that will make you relate to its characters and have you enjoy each episode's antics. Like the name of the titular character, this anime is so sweet and cute that you will probably forgive any fault that you see in it. The best thing in this anime is the characters. The fairies Sugar, Salt and Pepper are so cute, but not in the annoying way. Choro-sama, the elder fairy, will also make you laugh with his silly antics over his obsession with Ginger - a fairy obviously so much younger than him! Basil and Cinammon are also characters who, despite their bratty and rascal ways, will worm their way into your hearts. And if you watched Card Captor Sakura, you just might be in for a surprise. The artwork is so similar but the Tomoyo-looking character is the frenemy (friend/enemy) of one of the lead characters - Saga (patterned after Sakura). I found this to be very funny - seeing a totally different Tomoyo. My only complaint about the artwork is that the characters probably wore the same outfit all throughout the series, in stark contrast to Card Captor Sakura\'s numerous costume changes. The story is simple, but still quite complex. It won\'t let you look that hard for questions about your life, but it will make you wonder if you found your own Kirameki - whatever that is. I can not express words how good this anime was. In fact, the anime itself delivers message that is unique for each viewer. Do not let its prominent shroud of childish folly trick you into thinking it is another anime for children for it is entirely in reverse. However, the kiddies are still more than welcome to watch it with you as this anime rarely has any adult contemporary in it. What holds this anime up to very high standards is that, not only did it deliver a very overwhelmingly-good storyline, but all of this was entirely original and not based off a manga which destroys any complaints against whether or not it "stayed true" to such a thing as it is non-existent here for this original anime possesses a very strong and innovative story. If the characters are too cheesy for you to tolerate, then perhaps the beautiful piano symphony will make up for that. With the budget that they had for it, the music comes off as no surprise that it is excellently composed and each song in the anime conveys a different style where nothing falls under repetition; a quality that is very rare to find in an OST of an anime. The production value of this anime is so high that it feels like you are watching something in the late-thousands despite it existing around the early-thousands. The animation, voice acting and music all feel like they are half-a-decade or more ahead of their time. So if one of your peeves with thousands anime is its quality not being too good, think again with this one. What you get here is a story that is unforgettable, WILL make you tear up towards the end and will all be done in resplendent classical piano throughout the whole ordeal. Well normally it would come off as tedious if all you hear is piano, the songs you will listen to are all unique. If you need something different from your usual fare, A Little Snow Fairy Sugar has it. Feast Your Eyes: The Best Food in Anime! Whether they're saving the world, destroying it, or just trying to pass their exams, every character gets hungry at some point. Good thing anime has some of the best food you'll ever see—magical, mundane, and even monstrous! Let's salivate over some of the tastiest 2D dishes.